This book teaches you everything from the spirit behind Bonsai trees to the actual creating of them, something very special. The best plants to turn into Bonsai. Supplied as an 80 page (A4), softback book. To evoke the spirit of nature, that is the essence of bonsai. What place in nature is special to you? A spot under a blossoming cherry tree? A moss carpeted forest? A pine studded crag? Your own bonsai can take you to that place. The first section of this book is for inspiration, to give you a feeling of the spirit of nature reflected in the art that is bonsai. The second section gives you the ‘hands-in-the-dirt' instructions that will bring that spirit of nature alive for you. For information and value in our view it's unbeatable. Yes, there are some nice colour plates - but not at the expense of easily read and understood text; equally there are many first class line drawings and illustrations. Please be aware these books were printed in 1976. Sunset Books / Lane Publishing Co.
Illustrations: mainly black & white, some colour. 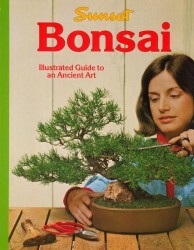 Bonsai - An Illustrated Guide To An Ancient Art has no related products.